Butyrylcholinesterase (BChE) belongs to the same structural class of proteins as acetylcholinesterase (AChE). The 440kDa tetrameric glycoprotein is predominantly found in blood, kidneys, intestine, liver, lung, heart and the central nervous system. BChE preferentially acts on butyrylcholine, but also hydrolyzes acetylcholine. Alzheimer’s disease appears to be associated with decreased acetylcholinesterase activity and an increase in Butyrylcholinesterase activity. BChE activity, therefore, has potential applications as a biomarker for progression or as a target for future therapies. Measure BChE activity as fluorescent readout; endpoint or kinetically. Run serum, plasma, CSF or cell/tissue lysates as samples. 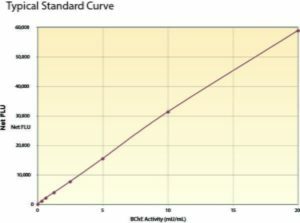 Sensitive – measure <0.02mU/ml of BChE activity. The Fluoro Butyrylcholinesterase Activity kit is designed to quantitatively measure butyryl- cholinesterase (BChE) activity in a variety of samples such as serum or plasma, cell and tissue lysates. The kit utilizes a non- fluorescent molecule, the Thiol Detection Reagent, that covalently binds to the thiol product of the reaction between the BChE Substrate and BChE in the standards or samples, yielding a fluorescent product read at 510 nm in a fluorescent plate reader with excitation at 390 nm. Cokugras, AN. “Butyrylcholinesterase: Structure and Physiological Importance.” Turk J Biochem 2003; 28(2): 54-61. Carmona GN, et al., “Butyrylcholinesterase accelerates cocaine metabolism: in vitro and in vivo effects in nonhuman primates and humans.” Drug Metabolism and Disposition 1999; 28(3): 367-71. Allam AR, et al., “Alzheimer’s disease and Type 2 Diabetes mellitus: the cholinesterase connection?” Lipids in Health and Disease 2006; 5:28. Greig NH, et al., “ Selective Butyrylcholinesterase inhibition elevates brain acetylcholine, augments learning and lowers Alzheimer beta-amyloid peptide in rodent.” Proc Natl Acad Sci USA 2005; 102(47):17213-8. Lane RM, et al., “Targeting Acetylcholinesterase and Butyrylcholinesterase in Dementia.” Int J Neuropsychopharmacol 2006; 9(1): 101-24.